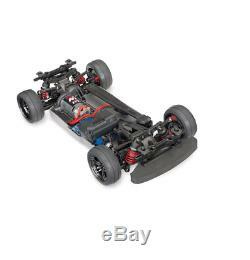 TRA83024-4 4-Tec 2.0 1/10 Brushed RTR Touring Car Chassis (NO Body) Traxxas. 1/10 Scale 4-Tec 2.0 AWD Chassis - Brushed! The 4-Tec 2.0 AWD chassis provides the ultimate on-road driving experience. The high-tech chassis keeps weight positioned as low as possible for a crisp, responsive feel. The modular interlocking design allows easy maintenance while providing unprecedented rigidity and tight tolerances. A smooth undertray reduces drag and prevents snags on expansion joints while the finely tuned suspension keeps the wheels glued to the pavement for maximum on-road performance. The waterproof XL-5 electronic speed control channels power to the Titan® 12-turn motor for four wheel tire-spinning acceleration and blistering 30+mph top speed. This is one chassis that begs to be driven hard! Some vehicles claim to be "brushless compatible, " but neglect to mention the long list of parts required to handle the extra power. At Traxxas, we build our vehicles tough enough to be brushless ready out of the box. The 4-Tec 2.0 chassis allows the massive VXL-3s power system to drop right in with minimal modifications. Adjustable chassis accepts standard 200mm bodies. TQ 2.4GHz radio system. Waterproof electronics for all-weather, all-season R/C excitement. Titan® 12-Turn 550 modified motor. Powerful XL-5 waterproof electronic speed control. Built brushless ready for easy upgrade to Velineon® power. Low-CG fiber-composite monocoque chassis with high approach angle front bumper. Hardened Steel Bevel, Sealed, Limited Slip. Molded Tub / Nylon Composite. TQ 2.4GHz Radio with #6519 3-Channel Micro Receiver. 158mm long / 46mm wide / 23 or 26mm high. 4 "AA" Batteries (for transmitter), Charger, 6 or 7-Cell NiMH or 2-cell LiPo Battery. 6 or 7-cell NiMH Battery Pack, or 2S LiPo Battery Pack w/Traxxas Connector. (4) "AA" Batteries (For transmitter). Brand New in the Package! Brand New in the Package!! Be sure to add me to your favorites list! Unfortunately, we have no control over what happens to a package once it leaves our facilities. It is a rare occurrence but occasionally packages will be lost. We will work with you to resolve the issue, but we cannot file a claim for a lost package until 30 days have passed. By purchasing an item from us, you agree to allow 30 days for your package to arrive. We will work with you to resolve the issue. By purchasing an item from us, you agree to allow 45 days for your package to arrive. > < STOCK STATUS: We are a Full-Time Brick and Mortar Hobby Shop. Inventory levels are subject to change based on in store and/or distributor stock levels! The item "TRA83024-4 4-Tec 2.0 1/10 Brushed RTR Touring Car Chassis (NO Body) Traxxas" is in sale since Friday, March 1, 2019. This item is in the category "Toys & Hobbies\Radio Control & Control Line\RC Model Vehicle Parts & Accs\Body Parts & Interior\Cars, Trucks & Motorcycles". The seller is "world_of_rc_parts" and is located in Wilson, North Carolina. This item can be shipped worldwide.